Artists enable audiences to envision and make sense of the world, providing a lens through which society and the self are perceived. In times of division and fragmentation, many artists have confronted socio-political issues head rst, illuminating truths and raising questions. Such work is broadcast loudly to powerful e ect, serving as a force for change. Stillness Speaks sheds light on works which are no less important. 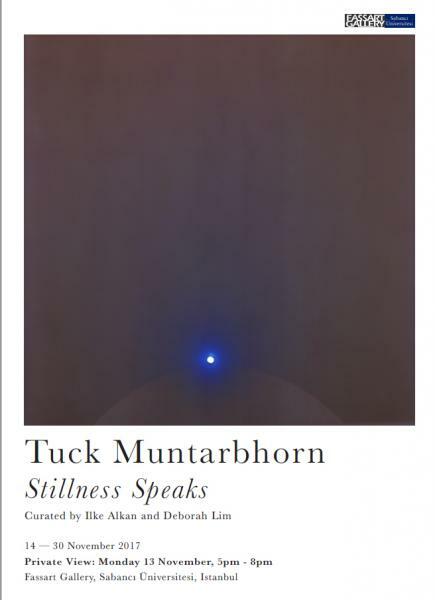 The exhibition comprises a series of contemplative photographs by Tuck Muntarbhorn, and underpin the artist’s rst solo exhibition in Istanbul. Moving past the uncertain and chaotic present, these works encourage viewers to look inward - providing a sanctuary for peace and serenity. By transcending external objects and matter, the images allow for the revelation of nature’s eternity. Muntarbhorn asserts that his art and life are connected - by walking a spiritual path and living a life of wholesome consciousness, his works are able to express his love of truth and beauty. The title of the exhibition can be understood from a metaphysical or spiritual perspective, encouraging viewers to be still, contemplate and listen. Inherent in Muntarbhorn’s practice is a process of steadying the mind, meditation and prayer in order to reach a state of surrender. Each image is captured in an intuitive movement, from the viewpoint of one’s unconditioned self. Breathing with the camera, images result that remain untouched by emotions, perceptions and preconceived ideas. Muntarbhorn creates a channel for exploration - in service of the individuals who look upon the artwork - stepping forth to provide rest for their souls. All works © Tuck Muntarbhorn, courtesy of the artist.